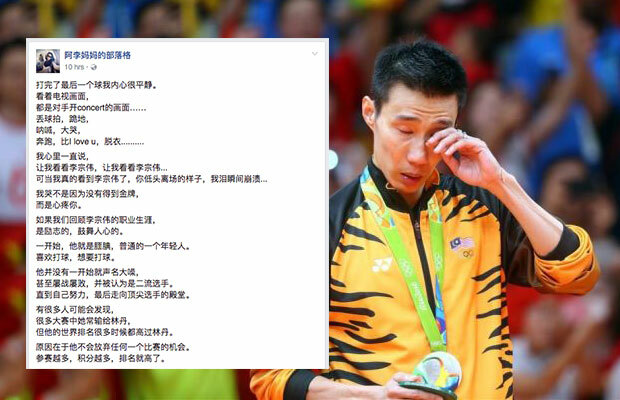 This was not written by Lee Chong Wei’s mother. It is an open letter written by another mom whose surname also happens to be Lee. We have already made the necessary corrections and you can read the updated article here. A mother wrote this letter after the Finals at Rio Olympic. 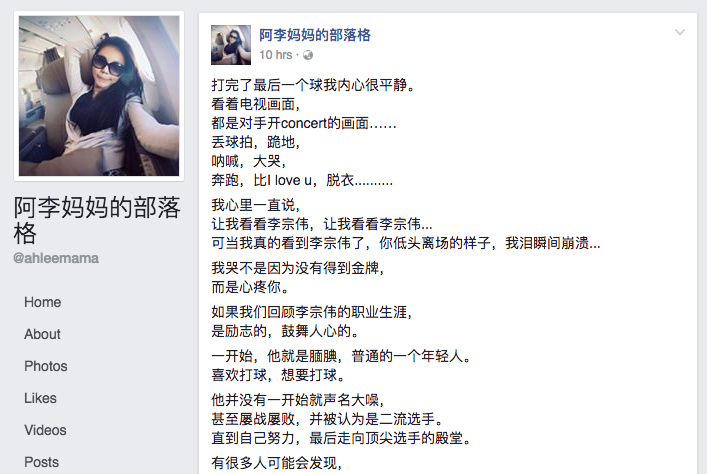 We have translated the post for those who cannot read Chinese. I cried because I feel for you. It is an inspirational one. He loves badminton, he wants to play badminton. On the contrary, he was defeated again and again, and was even considered as second-rate player. Through his own efforts, he finally joined the top players in hall of fame. But his rank was always higher than Lin Dan. The reason being that he will not give up the opportunity to compete in any competition. More competition, means more points, and that pushes up the ranking. Why can’t he be like any other top player? Participate only in major tournaments? It’s because he cannot attain high level trainings back home. He can only make up to that by joining competitions. To improve his competitive skills. This explained Lee Chong Wei’s hardship perfectly. But he always managed to force his opponent to focus when they are up against him. He made Lin Dan fight with all his might – this is Lin Dan’s respect to him. He fuelled Chen Long’s hunger to win – this is Chen Long’s respect to him. A person that can be a threat to others, is a good opponent. Because to his opponent, to play against him is like getting a “Wild Card”. To me, he has never lost to anyone. He is just like everyone else, losing to time and age. There will always be a younger generation that will catch up with us. He finally won against Lin Dan. We just want you to win for yourself. Can gaze upon our national flag on TV without doing anything. There are many reasons to retire. And fought until the very last point. What was the very last point? The very last point was the Finals up against China. He completed “the whole tournament” in the very best way. He was World Number 2 throughout the 12 years. For 12 years, he only lost to World Number 1. These 12 years, he remained on that position. But World Number 1 is not the same person anymore. Perhaps to others, he is forever Number 2. Perhaps to others, it is his fate. But to me, he will always be that best Supporting Actor. He helped propel others, but he himself is not inferior in any respect. But for Malaysians, we will never forget the outstanding supporting actor. For many years, you covered the whole Malaysia Badminton arena. Today, let us cover you. To us, you, are priceless. Just now my son asked me, isn’t the competition over? Waiting for him to wear the medal. We will accompany you, for the perfect curtain call.